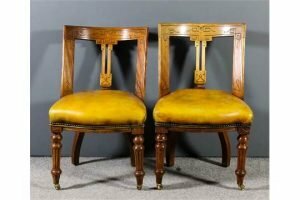 A pair of Victorian mahogany framed dining chairs, the curved crest rails, uprights and fretted splats carved with “Greek Key” ornament, the seats upholstered in tan hide, on turned and fluted front legs and castors. 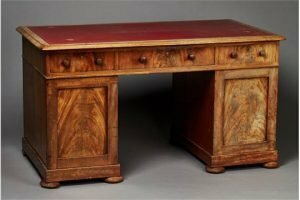 A George IV figured mahogany twin pedestal desk, the moulded top inset with red leather above an arrangement of three frieze drawers and a pair of panelled cupboard doors, each enclosing three further drawers with inset brass handles, raised on bun feet. 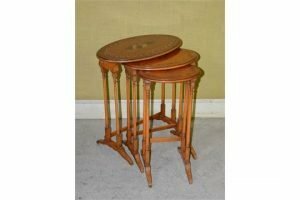 A late 19th/ early 20th century carved pine Blackamoor dressing table stool, with an adjustable revolving upholstered seat. 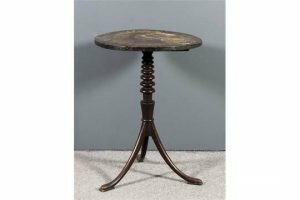 A late George III mahogany circular tripod occasional table, the top inlaid with central four pointed star within segmented border, on bobbin turned central column and three splayed legs with rectangular pad feet. 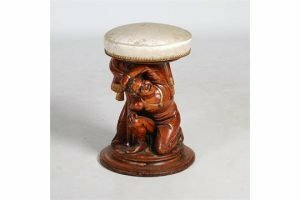 A nest of three early 20th century painted satinwood occasional tables, the largest decorated with an oval panel of ladies drinking tea within a ribbon tied and floral garland border. 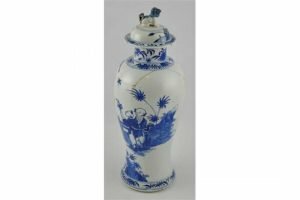 A Kangxi style Chinese blue and white baluster vase and cover, decorated with figures in a garden landscape. 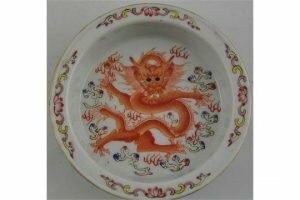 A Chinese famille rose dragon water pot, decorated with a dancing dragon, bears a six character style Jiaqing mark to the base. 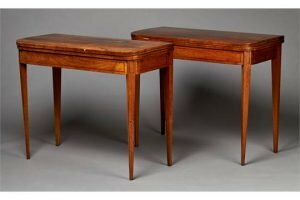 A pair of late George III rosewood fold-over card tables with overall crossbanded borders, the hinged tops opening to reveal inset green baize, raised on square tapering legs. 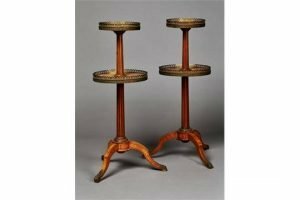 A pair of mid-19th Century Neoclassical Revival kingwood and gilt metal mounted two-tier étagères, each level inlaid with an overall lattice within pierced galleries and rims cast with berried laurel leaves, the fluted stems raised on tripod downswept supports terminating in cast acanthus leaf sabots. 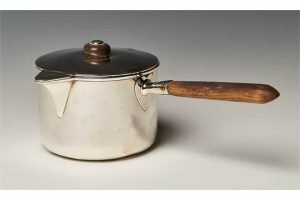 A Victorian silver brandy pan, the detachable lid with a hinged spout cover and turned wood finial, the cylindrical body with a wood handle, London 1881. 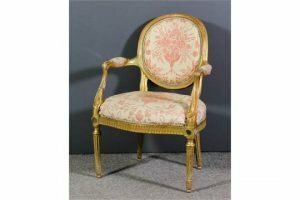 A French gilt framed fauteuil of Louis XVI design with moulded show wood frame, the oval back, seat and arm pads upholstered in red and white linen, on turned and fluted front legs. 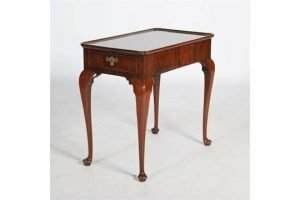 A George III mahogany silver table, the rectangular top with a slightly raised edge and re-entrant corners above a cockbeaded end drawer, raised on four cabriole supports with pad feet. 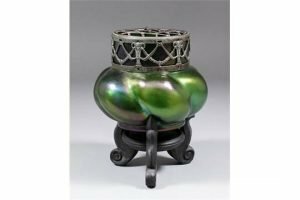 An Art Nouveau six lobed glass pourri vase, with a silvered metal pierced cover, of dark green iridescent tint. 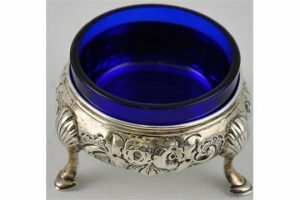 A large Victorian solid silver salt with liner, hallmarked London 1855. 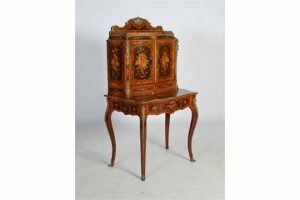 A late 19th century French Revival kingwood, marquetry and gilt metal mounted Bonheur-de-jour, the upright back with a pair of cupboard doors over a pair of small drawers, on a base fitted with a frieze drawer enclosing a writing surface, raised on cabriole supports with figural and foliate cast mounts, profusely decorated all over with sprays of flowers in scrolling borders. 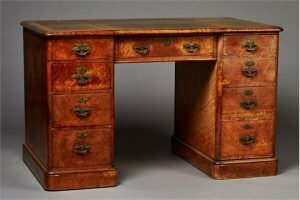 A mid-Victorian bird’s eye maple twin pedestal desk, the moulded rectangular top inset with gilt-tooled green leather above an arrangement of nine drawers, raised on plinth bases. 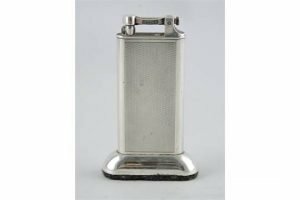 A large Dunhill tallboy silver plated table lighter of rectangular form, engine turned on raised oval base. 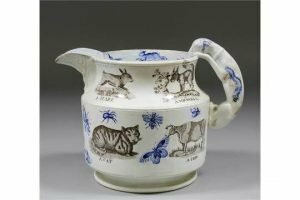 A 19th Century English White ware pottery jug with moulded hound handle, printed in sepia with named British animals and in blue with insects and birds. 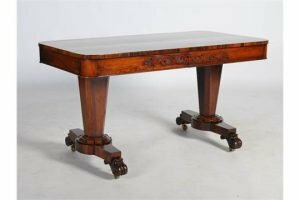 A 19th century rosewood library table, the rounded rectangular top above opposing blind frieze drawers, fret cut scroll work detail, raised on tapered octagonal trestle ends with scroll carved feet and brass casters. 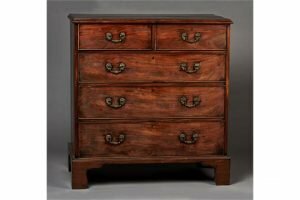 A George III mahogany chest of two short and three long graduated drawers with applied gilt cast brass foliate handles, raised on bracket feet.